For those wondering about those Industry Nine wheels, here’s the DRAWING. Click on image for flier. Facebook event HERE. Come experience Kolo Flow at Asheville’s new bike park, with miles of undulating trails and fun around every bend and berm. Collegiate and open racing for all categories in short track, super-D, and cross country. Plus coed team relay for collegiate, a new event at this year’s Collegiate National Mountain Bike Championships. 100% payback in Cat 1/Pro Open Category. See below for Cat 1 payout structure. Open Short Track and Super-D: All Categories $20 for each race. Click HERE for flier and full event scheduling and information. Click HERE for information on rules/structure for Collegiate Team Relay. 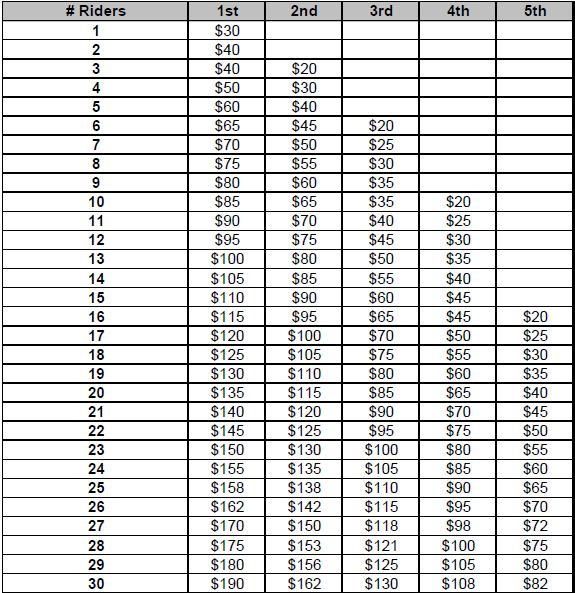 Cat 1 payout structure for Sunday’s cross country below. Cat1/Pro Open payout is 100% payback and is a separate structure, not this one.